Vacations in British Columbia, Canada, are as diversified as the province itself. 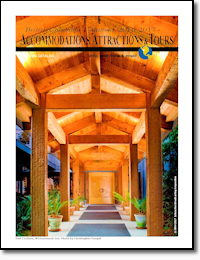 BC's tourist accommodations, attractions and tours are among the finest in the world. Alive with breathtaking scenery, exciting attractions, urban and wilderness tours (grizzly bear viewing, whale watching, eco-tours, marine excursions and more) and featuring some of the friendliest hospitality and most comfortable lodging and accommodations. From luxury hotels to unique wilderness lodges and ocean front resorts, it's no wonder that British Columbia, Canada, has become a world famous travel destination. The BC Vacations, Accommodations, Attractions & Tours Catalog is a free trip planning guide for travelers planning their British Columbia vacations.